Over 1-3" of rain fell across the area Friday. After 4 dry days things change today with a pretty good dose of substantial rainfall. As of 8:30pm (March 21st) many locations measured 1-3" of rainfall. Areas of west of Baltimore though saw amounts over 3"+ with localized spots of 6" or more. The mountains of the Shenandoah Valley even picked up 8"+ of snow. A strong area of low pressure continues it trek close to the coast while pulling in abundant moisture off the Atlantic. Strong northeasterly flow combined with moisture pooling against the mountains has created the perfect environment for heavy rainfall. 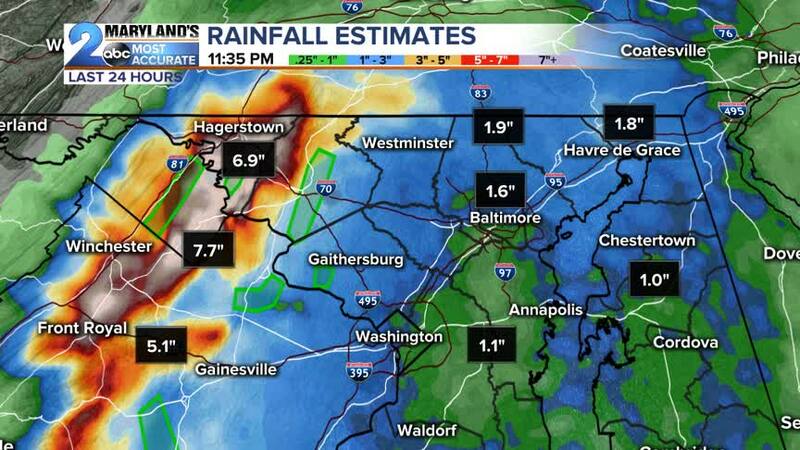 For that reason Areal Flood Warnings continue through early Friday morning for (Baltimore, Howard, Harford, northern Anne Arundel, Baltimore City, Carroll, Frederick, & Washington Counties). Over 1-3" of rain has fallen in these locations leading to small streams and creeks to come out of there banks. Scattered showers look to remain overnight as the storm system pulls away. With that said gusty winds will be our next weather feature of concern. Since our area of low pressure is so strong the northwest flow that looks to punch down on the backside will be pretty gusty. Many look to see sustained winds of 20-30 mph Friday and Saturday out of the northwest with gusts toppling 45 mph Friday afternoon. Besides the wind Friday afternoon showers will continue to pinwheel through with even a few flurries north and west of Baltimore as colder air drains in. Morning temperatures come Saturday will be near freezing with winds gusting out of the northwest upwards of 35 mph driving in sunshine in the metro and upslope snow showers over the Western Maryland mountains. For that reason Wind Advisories may be issued by the National Weather Service since the winds look to blow over an extended period of time. If you have anything loose outside such as trash cans or patio furniture you may want to tie it down. Power outages could also be possible as trees may topple with the saturated ground below. At least by the weekend, things look to dry out again. This will actually be the first time that we have seen consecutive weekends of dry weather since late January and early February (01/26-01/27 and 02/02 and 02/03) of this year. Winds should die down by Sunday making it the better day to be outdoors especially with high temperatures near 60 degrees. A much better comparison to last year where we had snow on the ground and highs near 50 degrees. Our next chance of rain arrives by Monday with another powerful cold front. This front looks to change any rain over to snow late Monday night into early Tuesday morning before temperatures start to warm once again for the mid-week.